GOOD news for tens of thousands of unpaid employees of Air India as they may soon get their April salaries. 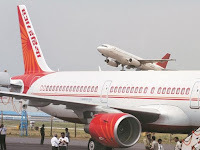 The government on June 7 said it will resume equity infusion into the airline — which was stopped after it had decided to sell it off — and that it will give guarantee for a Rs 1,000-crore loan to the Maharaja which banks had revoked after the divestment bid was announced last year. off the debt-ridden airline in the remaining 11 months of its tenure. “Employees will be paid their salaries as the fund flow of government through equity infusion will begin and the loan guarantee (for Rs 1,000-crore) will be given,” a senior aviation ministry official was quoted as saying. The AI-specific group of ministers, headed by finance minister, was supposed to meet on Thursday but that meet was deferred as the stakeholders are evaluating why the bid failed to get even one offer and whether and how the terms of sale needs to be changed to hand over the Maharaja to a private player. “If the government decides to pursue AI divestment, everything like revising bidding norms will be finalised soon. The transaction advisor will be retained if the sale course is being pursued by revising the offer,” the official said. Asked if the government could look at selling entire 100% in Air India, the official said, “We would look at simplifying some of the norms, but it would not be entirely different from what the thinking behind the disinvestment has been earlier. National carrier has invited bids from financial institutions and banks for a Rs. 1,000-crore government guarantee-backed Short Term Loan (STL). "Air India is inviting bids for Government Guaranteed INR STL totalling to Rs. 1,000 crore to meet its urgent working capital requirements," the airline said in a tender document issued on June 5. It further said, "The tenure of the loan will be for one year (renewable) from the date of availing the STL. The amount of Rs. 1,000 crore will be drawn in June' 18 in one or more tranches. The government of India guarantee is presently valid for one year."